Sister Mary Romanus (Mary Catherine Finnigan, known to her family as Maureen) was called by God on 10th August 2017, the day after her 96th birthday. Born in Te Kuiti, New Zealand, she was the fourth child of Irish couple Dennis and Jane Finnigan. There she grew up on the farm at Aria with her two sisters and two brothers in a family marked by the deep faith of their immigrant parents. Her father’s sudden death when Maureen was only five had a lasting effect on her. Her first job when she finished schooling was working for an accountant. She then worked in a jam factory until World War II broke out and she moved to an ammunitions factory, checking that ammunition was perfect before it was boxed. When Maureen knew she wanted to enter the convent, her parish priest asked the manager to release her from the work. 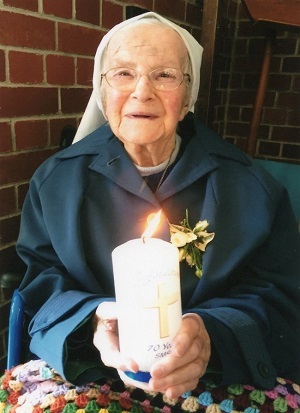 She entered our Heretaunga novitiate in 1944, taking the name of Mary Romanus when she was received as a novice. Professed on 15 August 1946, Sister was an SMSM for 71 years. Immediately after profession Sister continued at Heretaunga, sharing her culinary skills with the novices. In 1949 she was sent to the Chatham Islands. It was around this time that she injured her back; this had a life-long effect. In 1950 Mary Romanus started nursing training at the Home of Compassion, Island Bay, however she was not able to complete the full course. Her health also prevented her from being missioned to tropical countries. When Bishop Liston of Auckland asked the Congregation to set up a hostel for Maori girls in Ponsonby in 1952 Sister was one of the foundation members of the St Anne’s community, catering for the 24 girls and helping them adjust to life in the “big city”. She spent several years on the staff at Lourdes Hospital in Killara, Sydney, and, on three occasions, was missioned to the hospital in the isolated Chatham Islands, east of NZ. There she was not only a compassionate carer, but also she became a proficient bread maker. Ever attentive to do what God asked of her through her superiors, Sister served in a number of communities in New Zealand, rendering many different services. Her missionary spirit showed in multiple ways. Over many years she sent copies of the monthly Archdiocesan paper, Welcom, to smsm around the world. These always included a little note of greeting. She was known for her exacting preparation and selling of used stamps to help finance missionary work. In the late 1960s, while in the community at St Brendan’s School, Heretaunga, she made the fudge that was sold daily to help finance furniture and teaching aids for the classrooms before the school received Government aid. Mary Romanus was remarkable in her attentiveness to benefactors: by phone or letter, remembering birthdays, being present at family occasions - notably funerals. Her gentleness and ready smile endeared her to others. During her years in Heretaunga she took particular interest in welcoming groups who met regularly at the convent: the Third Order of Mary, the Marian Mothers and Catholic Women’s League. Dedicated in her care of sick sisters in community, she also loved to look after the community chapel, was a very good bookkeeper, and a talented seamstress. We have so many memories of Mary Romanus: her faithfulness to prayer, her love of the Eucharist, her availability, her meticulousness, and her ability to listen. She greatly enjoyed relaxing with the daily crossword puzzle and a good game of scrabble. At the vigil for her funeral, one of Sister’s cousins spoke of her attachment to her religious habit - not because of rigidity, but as an expression of love for her religious family. In 1995 she moved into her final smsm community in Avalon. Her slight figure became well recognized around the local area. Her later years were ones of peace and contentment in spite of diminishment and suffering which she accepted as part of the aging process. Many people asked to be remembered in her prayer. Sister Mary Romanus moved into care at the Home of Compassion, Silverstream, in May 2017. She had had cancer and heart disease for some years, but it was pneumonia which finally carried off this valiant warrior. The funeral for Mary Romanus was at St Martin de Porres church, Avalon, on the feast of Mary’s Assumption into heaven, the anniversary of Sister’s profession in 1946. As celebrant, Fr Roderick Milne, sm, noted, the focus was on Mary – and that would have been how Mary Romanus wanted it. In accord with Sister’s request, she is buried at Karori Cemetery in Wellington. and the ark of the covenant could be seen inside it. May Mary ask God to bring Sr M. Romanus into this place of joy and peace now that she has finished her journey on earth.